Memories are a funny thing. We all have those vivid recollections in our mind that play back like they happened yesterday, but others fade into obscurity no matter how hard we try. Even if we forget, though, the feelings remain. Like echoes of what once was. The Gardens Between is a puzzle game for the PS4 that explores the memories of two close friends in a truly unique way. The visuals, soundtrack, and even the design of the levels all impart a sense of place and evoke the feelings associated with the past experiences of these two young people. Does it all come together into a must-play experience? Read on to find out! 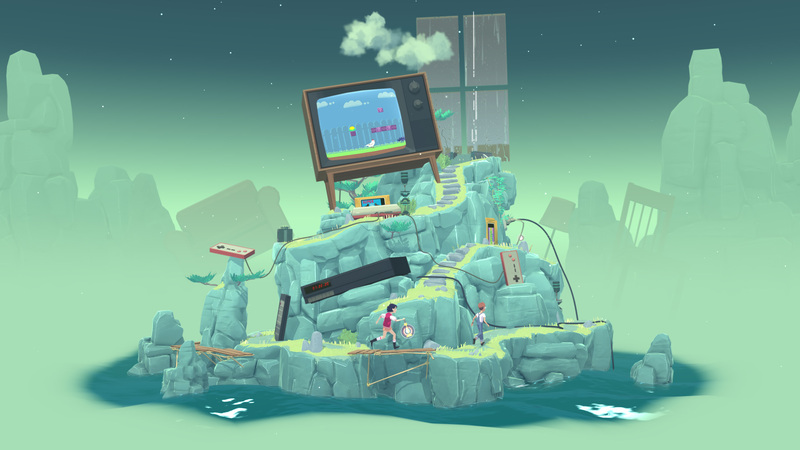 The Gardens Between is one of those games you could finish in a few sittings, but within the twenty or so levels, the game manages to tell a story that we can all relate with. What starts as a typical night hanging out in a treehouse surrounded by a concrete jungle quickly becomes a surreal trip into a strange world. The two friends find themselves on a small wooden ship in a vast ocean. Islands are dotted across the water near them, each one representing a memory they shared together. You’ll navigate to each of the islands throughout your journey. Completing each set offers a glimpse at the memory that inspired it, along with a constellation that contributes to the game’s overworld. At the beginning of each level, the two friends find themselves on the shores of the island. Using the left stick, you can move time forward or backward and watch as they explore, hop, and otherwise climb through the environment. The path is set and defined, but you have full control over the forward and backward movement of time. Interactive elements also let you manipulate parts of the world or make progress towards your goal. The ultimate endpoint for each level is a pedestal at the top of the island where you must place a lantern containing a ball of light. The two characters, Arina and Frendt, each have their role to play in the puzzles. Arina carries the lantern that holds light spheres, while Frendt can interact with certain objects in the environment. Despite the game being shorter than other puzzle titles, each level here is lovingly crafted and breathtakingly detailed. Experiencing them for the first time is a truly amazing experience, so I’ll refrain from going into detail, but I’ll offer a few examples. As you move through the level, you’re manipulating time itself, so things around you move with the characters. If a structure collapses, you’ll see it break apart and the pieces fall across the island as you move forward. Going backward will result in the pieces coming back together. In a puzzle like this one, you may notice that a piece falls into a spot where it could form a bridge for you, but your character’s don’t get there in time. This is an example of how Frendt could use an interactive object to manipulate the state of the pieces independently of their movement, thus stopping time in a place where you can move forward. Now, imagine this kind of intricate design combined with other moving parts, interactive elements, and obstacles like smoke clouds or black holes that will devour the light from your lantern. I’m sure you can imagine how complex and intricate things will get with all these elements in play. In fact, you could even argue that all of these moving parts would be utter chaos, and in many cases you would be right. This is where The Gardens Between really took my surprise, though. Each of the levels is incredibly complex when you take a step back and look at the whole picture, and yet, it all flows incredibly smooth. I imagine it was a monumental effort to create what we have here, and the fact that I wish there was more is testament to how polished and wonderfully designed the puzzles were. While some may cry foul at the shorter length, there’s no denying that The Gardens Between values quality over quantity in every aspect of its design. Each puzzle solved is a satisfying victory and seeing it all in motion is nothing short of magical. The Gardens Between is situated at the intersection of both exquisite game design and wholly realized artistic vision. Not only does the game offer deceptively simple controls and insanely nuanced design in its puzzles, but it also looks like a painting come to life. The soft colors, tiny details, and lifelike animation all combine to really make this magical world feel like memories come to life. Combine this with a serene and soothing soundtrack, and you have the full package. The Gardens Between is a game about exploring memories, and it’s heartfelt tale certainly resonated with me. Could it have been longer? Sure, and I would have loved more puzzles and worlds to explore. Even so, I think the most valuable part of this experience are the memories I made for myself while enjoying this beautiful and lovingly crafted experience.